Girls of any age strive to look attractive and stylish all year round! And to emphasize femininity and give image expressiveness will help spectacular skirt, which you can sew with your own hands. Today, women’s clothing manufacturers offer a wide range of skirts, from the simplest to collectible designer items. 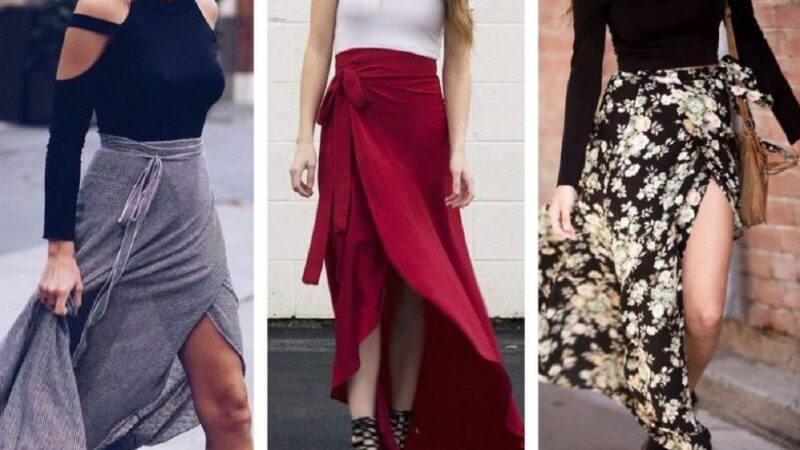 Today in the article we suggest to pay attention to an unusual model of an asymmetric skirt with a smell and, guided by a step-by-step master class with patterns, sew it with your own hands. So you can not only save your family budget but also get the opportunity to replenish your wardrobe with a unique model of hand-made production. Beginner masters and those who have never tried their hand at needlework can be alerted by contrived difficulties in self-tailoring skirts asymmetrical cut. In fact, the whole process is quite understandable and does not present much complexity. Using ready-made diagrams and patterns, you can quickly sew a new thing on the figure. Long ruler and measuring tape. In addition, you will need to measure waist circumference (measurements are made at the waist level), hips (measurements are made on the middle part) and product length (selected depending on the desired length of the skirt). According to the received measurements, a drawing is drawn up on graph paper. In the future, the cut pattern is transferred to the fabric and then the work goes on with the matter. Important! When building a drawing, leave extra seam allowances. Usually they are 1.5-2 cm, depending on the quality of the fabric; otherwise, the skirt will be narrow and uncomfortable while wearing. A simple pattern of a model with a smell is a section of rectangular fabric, which is given the required size and the excess parts are removed. Spread the fabric on a flat surface and smooth on both sides. Fold the cut in half (should get a square billet). From the top corner of the fold make a semicircular cut. In the future, it will be the waist. Below, you can also give the details a semicircular shape, if you plan to change the hem of the skirt or leave it unchanged. Then think for yourself: wrap it around your waist, leaving the ends in front of you. Cross the edges of the future skirt, putting them on each other, and mark with a pin or chalk the place where the button will be sewn (button). Tie the edges and stitch on the machine. Sew a button (button), which will fasten the edge of the skirt. For functionality and beauty, sew an elastic belt to the upper edge of the skirt. With it, you can adjust the size of the product. The skirt of an asymmetrical cut differs in an uneven bottom, where one half of the hem is several centimeters longer than the other. Taking the pattern for a straight wrap skirt, you can easily build a drawing of a model with an asymmetrical bottom. A width of the lower back part of the skirt slightly increases along the edges (up to 10 cm) – you will get detail in the form of a trapezoid. The front parts should be changed more radically so that when they are put on they form an overlap. To do this, draw a line from the side seam to the middle on one of the parts. Do the same manipulation with the second front part, but in a symmetric reflection. The result will be 3 parts: on the back of the skirt (in the form of a trapezoid) and 2 front parts. Transfer the pattern to the prepared material and cut out the parts with allowance for the seam allowances. Sweep the back and two front sides and stitch them on the machine, making the side seams. Then mark the place of the smell and fix with a pin. At the top of the smell just below the belt, make a hole for the button. On the part that will be inside, on the belt, sew a hook (button). Important! Not only buttons and a belt can be used as a fastener for an asymmetric skirt with a smell – zippers look stylish on such models. At the same time, the zipper is not stitched in for the entire length of the smell, but only 10-20 cm depending on the length of the skirt. Free side edges and the bottom of the skirt tuck and handle on a sewing machine. As a decorative element, you can make a patch pocket or its imitation. Also, buttons of large size, sewn in two parallel rows, look good. Skirt with expressive style is ready! In these new clothes, you will look feminine and stylish. The original model will favorably emphasize your advantages and hide figure flaws. 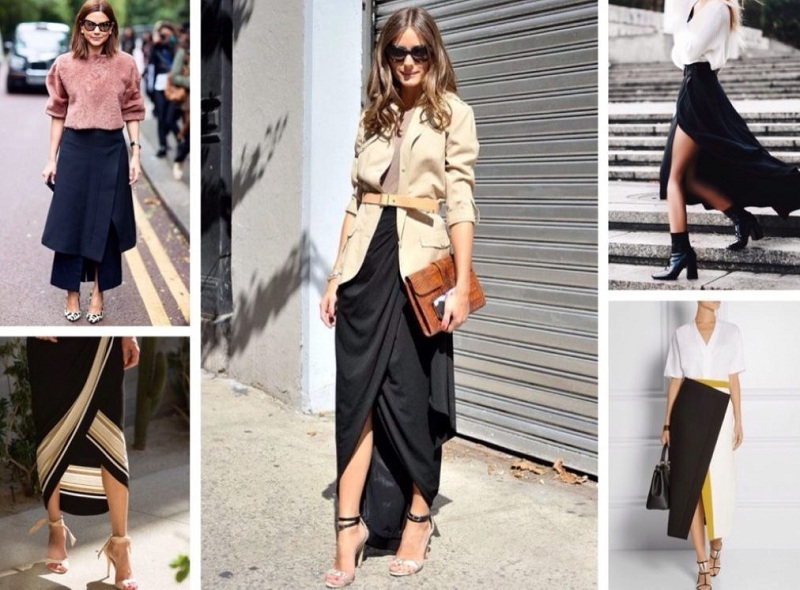 An asymmetrical wrap skirt can be worn with both high heels and shoes with a flat sole. The fabric for sewing such a model can be chosen absolutely any: knitwear, thick silk, chiffon, leather (eco-leather) – everything depends on the image and preferences you create. Do not be afraid to experiment and create new masterpiece models! How To Put Tiles In The Bathroom?